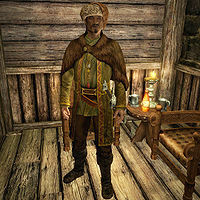 Hemming Black-Briar, a Nord warrior, is the son of Maven Black-Briar and brother of Ingun and Sibbi. Mjoll the Lioness, Riften's self-appointed protector, describes Hemming as a "spoiled brat" who follows his mother's word "like a loyal dog follows its master". Maul, Maven's bodyguard, also describes Hemming as stubborn, "like his mother; he sees what he wants and he won't quit until he has it." Should Maven become Jarl after the Imperials claim the Rift, Hemming will be appointed as her steward, and relocate to Mistveil Keep. Hemming wears a set of fine clothes with a matching hat and pair of boots. In combat, he relies on a leveled sword that can be up to elven in quality. He carries his key to Black-Briar Manor along with a belted tunic and a selection of upper-class loot and gold. Hemming spends the majority of his time inside Black-Briar Manor, and only ventures outside to meet his mother for drinks at the Bee and Barb in the evenings, between 8pm and his bedtime at midnight. After waking up at 8am he enjoys a two-hour breakfast then wanders around the house until 6pm when he sits down for a two-hour dinner. If Maven is appointed Jarl, Hemming will move into Mistveil Keep as her personal steward. He will move into his predecessor's old quarters and sleep there every night between midnight and 8am. He then spends the entire day at Maven's side, pausing only to sit down for meals at 8am, 1pm, and 7pm. If Riften is controlled by the Stormcloaks, upon first meeting him, he will comment, "Fancy yourself the adventuring type, eh? It's just as well, I doubt your combat prowess would prove valuable in a real battle anyway." He will then explain himself, "I was trained by some of the finest warriors in all Skyrim to wield a blade as if it was an extension of my own arm. My mother spares no expense where I'm concerned. I'm heir to the family fortune after all." He will reveal his ambitions for his family's meadery, "Once I'm in charge I have bigger aspirations than just Skyrim. I plan to bring Black-Briar Mead to all of Tamriel." and talk about his siblings he refers to as "children" (see bugs): "My children [sic], Sibbi and Ingun, are being groomed to run the family business one day as well. Sibbi will prove to be a fine leader one day, but Ingun... that girl has her mind somewhere other than business. Maven's disappointed that Ingun's heart isn't in the family business, but she says 'Ingun still has her uses.' Not sure what that means." As steward, he will instead have new greetings: "I'm Riften's appointed Steward. How can I help you?" or "Steward Hemming Black-Briar at your service." You can further inquire about what he does around the Keep and he will reply with, "I'm not certain what business it is of yours, but I'm moth... I mean Jarl Maven's steward." and elaborate on his job, "I run the prisons in Riften, keep the riff-raff from robbing the good folk of this city and have drunks tossed into the lake." You can ask if he handles the defense of Riften, to which he will answer, "Defense? No one would dare attack Riften. I'm not sure you realize just how well connected Jarl Maven is with the Empire. With a single snap of her fingers, we could have a legion here in a fortnight." Expressing that you think he is exaggerating will yield "I don't care what you think. The Empire put Maven on the throne for a reason. That's all you need to know." from him. If you instead comment that it's impressive, his response will be: "Indeed. You don't get to the position my mother's achieved by blind luck... her business sense and diplomatic skills are legendary." or "If you say so." if you say it's interesting. If asked, he will explain the importance of his family: "The Black-Briars have been instrumental in keeping Riften on the map. Before the meadery was opened almost fifty years ago, this town was nothing... a simple waypoint for those journeying on to Morrowind. Now, thanks to my mother's generosity, this city is making its mark." Hemming: "So, Talen. Have you reconsidered my offer?" Talen-Jei: "Sorry Hemming, I've no interest in becoming your valet." Hemming: "What's the matter, I thought you people were used to indentured servitude." Talen-Jei: "Xhuth! Black-Briar or not, say that again and so help me you're going to need more than your mother to protect you from me." Maven: "Hemming, I want you to personally supervise the next shipment." Hemming: "We already have people that do that and they make quite a bit of coin for it." Maven: "I don't trust them. Come to think of it, I don't trust you either, but at least you're family." Hemming: "Anything you say, Mother." Hemming: "Bersi still refuses to cooperate. What did you want to do?" Maven: "I've known Bersi a long time. Even before he opened that rubbish heap he calls a shop." Hemming: "And if he still refuses?" Maven: "Then put the thumbscrews on him and hit him... hard." Maven: "I know that!" OR "I can promise you when he's ready, he'll find the cell door unlocked." Hemming: "I understand, mother. Forgive me." Hemming: "There's still the matter of the prisoner to discuss. Now, his family is willing to contribute handsomely if we release him." Maven: "The execution will proceed as planned." Hemming: "But, mother... this is quite a sizable contribution and the crime doesn't befit such a harsh punishment." Maven: "Are you going soft on me, Hemming? Perhaps I made the wrong choice installing you as steward." Hemming: "No, mother. The execution will proceed as planned." Maven: "Hemming, have you dispatched that letter I gave you yesterday?" Hemming: "Yes, and I sent it with our fastest courier and under the cover of night, exactly as you specified." Maven: "Good. If I need to light a few fires in order to get what we need to defend this place from the Stormcloaks, so be it." Hemming: "I'm almost certain he'll reach the Imperial City tomorrow, so we should have an answer by the end of the week." Maul: "Your mother seems to have taken to her seat quite well." Hemming: "Yes, she's been grooming herself for this for quite a long time." Maul: "It's surprising the Council is allowing a Nord rule Riften under the Imperial flag. That can't be their first choice." Hemming: "Let's just say my mother knows which pockets to line and keep it at that." Hemming refers to Ingun and Sibbi as his children, which complies with the CK data, yet all other dialogue in the game dispute this, claiming Maven is mother to Hemming, Sibbi, and Ingun. This issue has been addressed by version 1.3.3 of the Unofficial Skyrim Patch; "My children" is removed from the dialogue and some of the relationshipdata is fixed.